BESTEK jump starter provides 400A peak of current, enabling you to jump start your car up to 4L gas engine or 3L diesel engine around 20 times with one single charge. The car jumper is also a 8000mAh power bank with one 5V 2.1A USB ports for you to charge cellphone and other USB device. Built-in advanced circuit protection, feel easy and ease to use on the road. 400A peak current allows you to jump start your vehicle up to 4L gas engine or 3L diesel engine around 20 times. Also a power bank with 8000mAh capacity and 5V 2.1A USB port, easy and fast to charge your cellphone, tablets, kindles, and other USB devices for emergency. 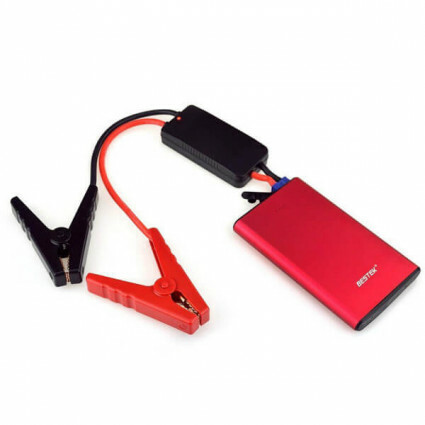 The jump starter kit is portable and lightweight, easy to take and store without occupying any space. Approved FCC, CE, RoHS with UL listed battery cells, the car jumper is safe to use. Built-in full protections to guard your devices against overload overvoltage overcharge and short-circuit.